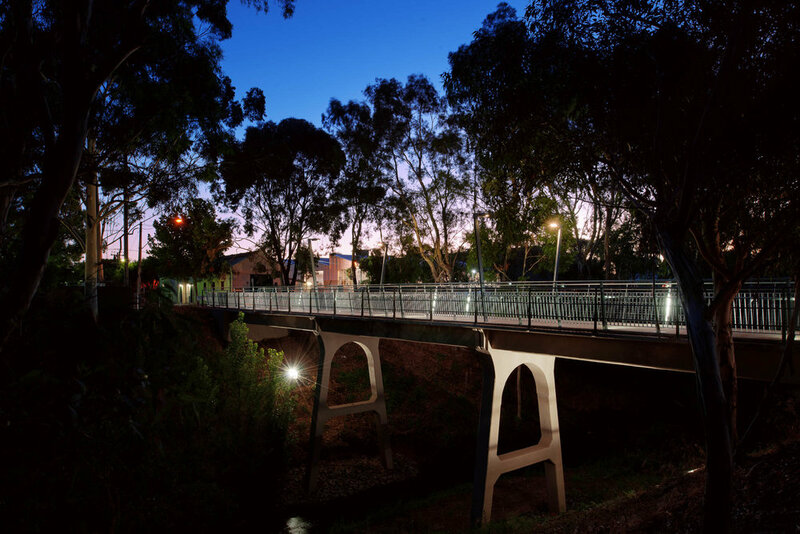 Flightpath played a role in conserving and enhancing the listed bridge across the River Torrens. The bridge had been declared unsafe and blocked from public access, causing frustration. Then came momentum for conservation and reuse. The bridge opened in 1909 and was designed by John Monash, who advocated the T-girder for economy and efficiency. The bridge was designed to carry a single tramway line. The repair was trialled on one edge beam. The conclusion was that remediation was cost-effective and possible. Existing balustrade posts were repaired off site and reinstated with new wires and handrails installed to the original detail. New galvanised balustrade with inset lighting was introduced and four light poles introduced to coincide with the supports. The original tram bed was filled with a new non-slip concrete surface and tram track pavers with lights inset. The project has added to the understanding of the history of the Sir William Goodman Bridge and its importance to the community. Integration of the bridge into the existing cycle and pedestrian network has ensured the use of the structure and provided public access. The urban design elements celebrate an engineering and community icon, replacing recent frustration.